The five-story A.W. Rich Shoe Company Building was built in 1900 and designed by architect Robert A. Messmer to house one of Milwaukee’s prominent manufacturers whose lines of ladies shoes were sold coast to coast. After the business closed during the Great Depression the building was occupied by another shoe company and then clothing manufacturers. By the 1990’s the building’s storefronts were filled in with concrete block, a large fire escape snaked down the east façade and decades of accumulated environmental pollution obscured exterior decorative details. Eppstein Uhen Architects purchased the National Register-listed building in 1998. The new owners made use of historic tax credits to renovate and restore their new 43,000 square foot building. Work began on the $2.5 million project in 1999. The building’s brick exterior was cleaned and the storefront windows and basement windows were restored. The looming fire escape was removed. Leaving the brick walls uncovered, using exposed ductwork and showing off the large Douglas fir supporting beams and ceiling timbers preserved the industrial character of the interior. Reminders of the shoe company survive from the shoe tacks in the columns to the ghost outline of an original staircase. Vibrant wall color, sleek furnishings and contemporary lighting lend a modern aesthetic to the venerable building and make it one of the more interesting interiors in the Historic Third Ward. Purchase and renovation of the A.W. Rich Shoe Company Building allowed the growing firm of Eppstein Uhen Architects to move from its cramped quarters at 210 E. Michigan Street and expand its staff and provide the kind of meeting spaces and flexible work stations required for their numerous projects. Today the firm is one of the largest in Wisconsin with over 120 employees and growing. To quote Brian McCormick, preservation architect with the Wisconsin Historical Society: “If one questions why an architectural firm would choose an old building over one of their own design, one need only to tour this building. Eppstein Uhen Architects has created an inviting and sophisticated space, one that amply displays the firm’s creativity”. The redevelopment of the Boston Store buildings represents one of the more significant mixed-use projects in the Westown neighborhood downtown. 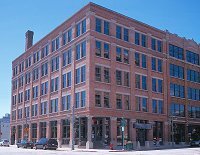 It has preserved the presence of a major retailer, preserved nearly 950 jobs, provided new loft style apartments with great views of the heart of Milwaukee and given new life to one of the prominent retail buildings in downtown Milwaukee. While once a vital project that challenged the supremacy of the suburban shopping malls, the Grand Avenue had fallen on hard times by the mid-1990s. Retailers like Marshall Fields and others closed, leaving the Grand Avenue with only one anchor, the Boston Store. Boston Store’s owners Carson Pirie Scott considered closing as well, and relocating its 750 corporate employees to Chicago. WISPARK and Wisconsin Energy Corporation responded to the challenge and worked closely with the City of Milwaukee and State of Wisconsin to craft a public/private partnership that would allow for a complete renovation of the building. Parent company Saks Inc. agreed to a long-term lease that would keep the Boston Store department store open and keep the 750 Carson Pirie Scott corporate jobs in Milwaukee. 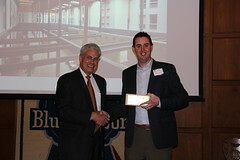 WISPARK purchased the building and invested over $38 million in its renovation. Exterior work included opening up windows, cleaning and painting, and restoring missing architectural elements. Interior work consisted in preserving two floors of retail and three floors of office space while converting the upper four floors into residential space for 74 loft style apartments. Underground parking was developed in the building’s basement for the residential tenants. The Boston Lofts Project is a testament to the creative collaboration between public and private entities. WISPARK LLC can be congratulated for its leadership role here in restoring a prominent downtown retail landmark and giving it a new lease on life. Once the gracious mansion of the leader of the largest brewery in America, the Fred Pabst, Jr. residence has long been a visual landmark on Highland Boulevard. Pabst’s love of horses is reflected in the prominent coach house situated behind the mansion. One of the largest in Milwaukee, the coach house is built of sturdy cream brick and embellished with architectural details that complement the main house such as corner quoins, modillions, lintels with keystones and arched windows. The ground floor was used for stabling horses and storing carriages. The upper story housed the coachmen and household staff. Subsequent decades saw the house transformed from mansion to rooming house to offices. The coach house underwent conversion to a garage and dog kennel and was basically left to deteriorate. Cream City Properties LLC purchased the property in 2001. Quorum Architects took up headquarters in the mansion while the coach house was renovated for the offices of Cream City Construction. In their adaptive reuse of the coach house, Cream City Construction preserved the exterior of the building while utilizing the remaining interior elements of the old coach house to guide the conversion. Paint was removed from the walls to reveal the cream colored brick. Blackened ceilings were cleaned of 100 years of accumulated dirt to reveal original tongue and groove, quarter-sawn oak boards. The original scored concrete floor was cleaned in the corridor area. The only two remaining iron bollards were retained and reused. The original porcelain basin used by carriage drivers to wash their boots was cleaned and installed in the new bathroom. An existing glass cabinet door was reworked into an interior window to allow for borrowed light from adjacent space. A door removed from the center hall was refinished and now serves as the top of a conference table. New work was inspired by existing materials that were salvaged from the building. Three new panel doors were installed surrounded by original pine wallboards. Office dividers were created to resemble horse stalls with cross-buck bracing, chamfered posts and balustrades topped with ball finials. The semi-open floor plan makes use of new technology as well with exposed ductwork and contemporary light fixtures. Cream City Properties, LLC is to be congratulated for taking a building whose use had become obsolete and transforming it into a inviting, attractive and functional space for their construction business. Gail Fitch has had a lifelong passion for church architecture and the spirituality that is conveyed by these all-important buildings. 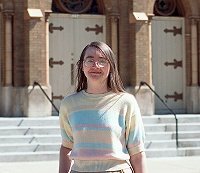 She has written about churches for Historic Milwaukee’s newsletter, ECHO, and has brought a number of obscure churches to light in her in-depth and well-researched articles. As a member of the former Friedens congregation Gail nominated the church for local historic designation and has kept that building in the public eye. Gail uses her voice and her pen to advocate for the sensitive remodeling and upkeep of our sacred building stock. She has been a regular attendee of the Historic Preservation Commission meetings and has followed the preservation process through at Zoning, Neighborhoods and Development Committee hearings. In her articles, Gail has also focused attention on neighborhood tours and programs that feature historic buildings as well as the activities of Historic Milwaukee Inc., with whom she has been a volunteer since 1996. Gail is also a member of the Milwaukee Preservation Alliance. Over the years Randy Bryant has become an indispensable and stalwart fixture of Milwaukee’s East Side preservation community. 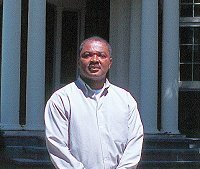 He serves on numerous committees and boards where he logs in countless hours at public hearings and neighborhood meetings ready with suggestions and ideas to make preservation work. Never one to take the easy route, Randy works behind the scenes on the nuts and bolts of preservation, on those less flashy but all-important matters of neighborhood planning and zoning and keeping on top of the nuisance issues created by inattentative absentee landlords. Randy has proven himself a true friend of preservation by stepping in to acquire endangered buildings and purchasing and restoring numerous residences. With a keen eye for quality, a drive for perfection in his restorations and a view of preservation’s big picture, Randy Bryant is deeply committed to retaining and enhancing the special character of Milwaukee’s historic neighborhoods. The 2004 awards ceremony also recognized the listing of 3 National Register districts and the local designation of 6 structures. East Village is Milwaukee’s only National Register Historic District that honors our immigrant Polish Community. The neighborhood that grew up around St. Hedwig’s Church, with its cluster of working class cottages and Polish Flats, preserves the character of a 19th century urban village with its irregular street pattern and dense development and the cohesiveness of the area is unlike any other neighborhood in Milwaukee. Threatened with redevelopment by condo builders, East Village actively sought National Register status to promote neighborhood pride in its immigrant past, make tax credits available for owners who sensitively rehab their homes and help as a planning tool in preserving the unique character of the district. The Pabst Brewing Company Complex was listed in the National Register of Historic Places for its significance in history as well as architecture. Under the leadership of Captain Frederick Pabst, the Pabst Brewing Company (originally founded as the Phillip Best Brewing Company) long set the standard for the brewing industry. It grew to the largest brewery in the country by 1874 and then the largest in the world by 1892 when it produced over a million barrels of beer in a single year. 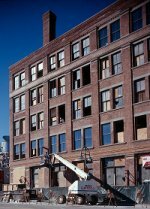 The Milwaukee facility was its place of origin and remained its principal production facility through most of the 20th century. The complex was designed to reflect the prosperity of the business and the German ethnicity of its owner and is in a remarkable state of preservation. The cream brick buildings with their crenellations and arches and stone detail remain visual landmarks in the city. Through the persistent efforts of James Heartel, Pabst Brewing Company sold the vacant complex and it is now awaiting redevelopment as Pabst City. Wispark and John Ferchill’s Juneau Avenue Partners LLC are working to make the redevelopment a reality. Sherman Boulevard has been a locally designated Milwaukee Historic District since January 25, 1995. Sherman Boulevard has long been recognized for its important collection of early 20th century residential buildings designed by some of Milwaukee’s best architects. Sherman Boulevard is also a significant example of the boulevard-planning concept and successfully linked Washington Park to Sherman Park with a divided roadway that serves as a linear park and distinguishes the thoroughfare from its more commonplace neighbors. Today the boulevard extends north to Silver Spring Drive and McGovern Park. The Sherman Park Community Association successfully spearheaded the efforts at National Register listing in order to further enhance the prestige of the boulevard, generate more pride in the area and enable owners to take advantage of rehabilitation tax credits. The University Club of Milwaukee was locally designated on July 24,2003 for its significance as an important survivor from Milwaukee’s golden age of private clubs. Its urbanity and luxuriousness were the direct result of the fine design work of John Russell Pope, an internationally renowned architect whose Georgian and Classical Revival buildings helped define the American manor house and the public style of Washington D.C., including the Jefferson Memorial. The Emanuel Adler House was locally designated on June 12, 2003 for its significance as an excellent example of an 1880’s hybrid style that combined the exuberant silhouette and layered detail of the Queen Anne with the bold massing and masonry work of the Romanesque Revival. It is the sole surviving example of this type on Prospect Avenue and represents an important early work of local architect Alfred C. Clas. Clas went on to an important design career with George Ferry and later became an influential planner in the city. The Adler House was previously listed in the National Register of Historic Places on September 13, 1991. The Arthur Manegold House was locally designated on November 14, 2003 for its significance as a pivotal building in the Layton Boulevard National Register Historic District and an important example of the Arts and Crafts Style as designed by Alexander C. Eschweiler. Eschweiler was one of the most prestigious residential designers in late 19th and early 20th century Milwaukee. The designation was able to prevent the demolition of the fire-damaged house and members of the Gramling family, who have historic ties to the house, are about to begin the restoration of the building. As part of the Layton Boulevard National Register Historic District, the Manegold House has been listed in the National Register since April 24, 1996. Milwaukee Fire House Ladder Co. # 5 was locally designated on November 25, 2003 for its significance as a symbol of the city’s first attempts at standardizing fire station house design and creating a recognizable civic architecture that would instill pride and confidence in government. Ladder Company #5 is the earliest surviving station house designed by Sebastian Brand, a Milwaukee firefighter who was elevated to the role of Fire Department architect and who put his distinctive stamp on station house design for over 20 years. Brand was the first municipal employee assigned to design buildings for the city and he left a legacy of finely detailed station houses, of which only a small number survive today. The State Street Bascule Bridge was locally designated on January 21, 2004 for its significance as the oldest surviving simple trunnion bascule bridge in the city of Milwaukee. The prototype for this bridge (built in 1904 and now demolished) was technologically important and was the first of its type in the United States. It is commonly referred to as the “Milwaukee Type Bascule” and became popular throughout the country for its relatively simple construction and ease of operation and maintenance. The State Street Bascule Bridge is also significant as the first bascule bridge here that was designed to meet aesthetic concerns and featured ornamental copper-clad bridge tenders houses and ornamental railings that set the standard for subsequent city bridges. The Avalon Theater was locally designated on March 2, 2004 for its significance as Milwaukee’s best surviving example of an “atmospheric” theater and the first motion picture theater in Wisconsin to be built for the new “talking” and “sound” pictures. Prominent local architect Russell Barr Williamson used a host of architectural embellishments on the exterior and interior to create a fantasy picture palace that included an auditorium made to simulate an open air Mediterranean courtyard.